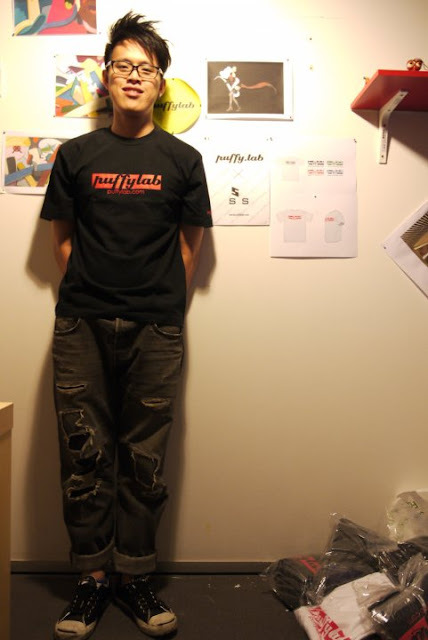 Puffy Lab is a local tees designers community to help tees designers to sell tees online. As an online website, Puffy Lab will take care of the printing and distribution of tees when Puffy Lab gets designs submitted from designers. Puffy Lab does profit-sharing with designers. For every tee that they sell on Puffy Lab, they will give up to RM5 to the designer of the tee. On the first version of Puffy Lab, internal staff of Puffy Lab will be the one who review all the designs submitted by designers. Hopefully, in the second version which they are working hard on now, they will hand the design judging responsibility to their community, mostly designers and customers. In the second version, for every design that is submitted to Puffy Lab, they will have a voting competition on those designs. Design with the most number of votes will then be the design that Puffy Lab will print and distribute. Now, Puffy Lab is having a launch event by giving out free launch tees to those who helps promoting Puffy Lab. Those launch tees come with three main colors(Awesome Red, Ocean Blue and Ultimate Mystery). They will have 20 Awesome Red launch tees for the lucky draw for those who sign up for Puffy Lab. And, if someone invites more than 15 people to sign up for Puffy Lab, he/she will get the Awesome Red launch tee instead of entering the lucky draw. If someone invites more than 50 people to sign up for Puffy Lab, he/she will get the Ocean Blue launch tee instead of the Awesome Red launch tee. Team from Puffy Lab thinks that people will admire you more if you own the Ocean Blue launch tee instead of the Awesome Red launch tee. Please help support local designers!! !